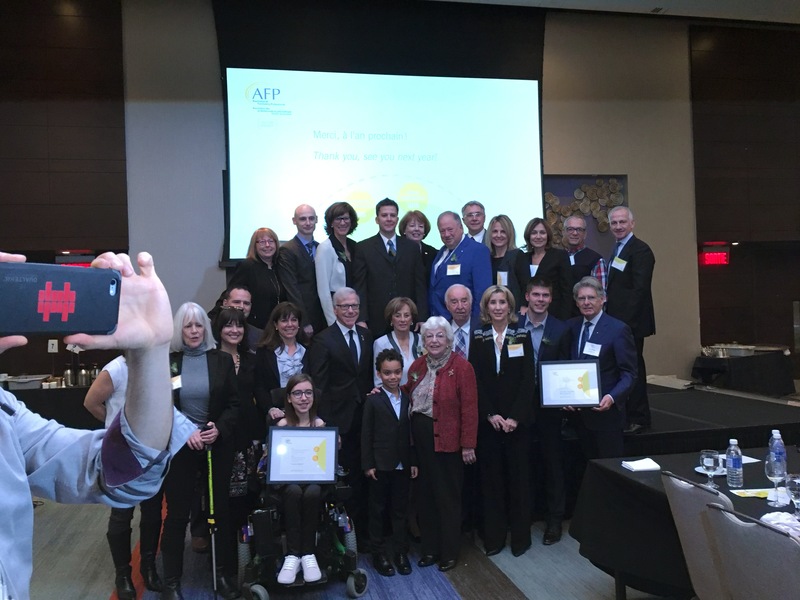 On November 15th, 2016, (National Philanthropy Day), the Défi Canderel was honored with an "Award of Excellence" in the Outstanding Corporation Category by the Association of Fundraising Professionals (AFP). The AFP is the world's most prestigious fundraising organization. Every year it recognizes outstanding achievements by individuals, foundations, corporate philanthropists, fundraising volunteers, and fundraising professionals. The keynote speaker was Pierre Bruneau (Anchor of TVA News); other distinguished guests who took home "2016 Excellence Awards" included Jean Coutu, John A. Rae, Lucie Rémillard, and Joan Ivory. Jonathan Wener, Chairman of Canderel, spoke movingly about how the Défi was born out of his wife, Susan's, personal experience of twice surviving cancer, and of the desire to make a tangible difference in the lives of others battling this disease by raising money for cancer research. The award ceremony took place at the Hyatt Regency Hotel (1255, rue Jeanne-Mance, Montréal). The Défi Canderel was created to raise funds to finance cancer research. It was created in 1989 as a corporate challenge, by the chairman and founder of Canderel Management, Mr. Jonathan Wener. May 2017 will mark the 28th annual edition of the Défi Canderel. Year after year, thousands of runners from the Montreal business community take up the challenge and raise funds to fight cancer. To date, the Défi had raised over $12 million for cancer research. On May 11th, thousands of superheroes will flood the streets of Montreal on a 2 km stretch between McGill College and Crescent streets. The goal: to raise $2 million.These funds will be given to the Rosalind and Morris Goodman Cancer Research Centre, McGill University, and to the Institut du cancer de Montréal of the Université de Montréal. Susan Wener, Jonathan Wener's wife, is a two-time cancer survivor and inspiration for the run. Susan Wener's book, Resilience, describes her journey through standard therapy as well as alternative methods of healing. AFP Quebec strives to advance philanthropy throughout Quebec and brings together fundraisers working in the province's non-profit organizations. The 250 members represent some 160 organizations and manage budgets of over $4 billion. They are important agents of positive change in our society. AFP honors those who hold high ethical standards and best exemplify commitment and dedication toward helping society. These international awards are given in recognition to those individuals and organizations whose lifetime or long-term achievements have made a significant impact upon society.